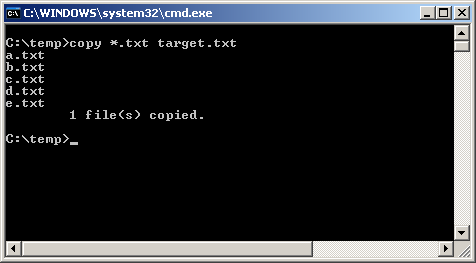 Here is the simplest way you can combine multiple text files into one single file. Lets say you have four text files a.txt, b.txt, c.txt and d.txt and you want to merge the contents of all the text files into one target.txt. This worked great, thank you. So simple! Why didn't I think of that?? Saved me writing a script to do the same thing, thanks! How to merge many text files in sub folder? This is just what I was looking for. is there a way of getting the file name in between of the combined files, to separate the files? I still can't figure this out. How do I change the directory where the file is located? I just tried this out and the file names were automatically inserted before the start of each file, on a new line and all. I didn't have to do anything special. I needed to combine 100+ scripts in 1 text file. This saved me a lot of time. Thanks! Fantastic - thanks for the help! Exactly what I needed, thanks! How do you place the original file name between each bit of text? Be handy if you had a lot of user scripts and you wanted to search one main document, but to pick out indivdual scripts you needed to edit/delete later? Saved me a lot of hassle - can be used to combine html files as well. This was immensely helpful. Thank you. And you newbies to computing who weren't around when DOS was the top list in computing classes think that DOS isn't used anymore or is archaic. Love it...good ol' DOS still does it best (and quickest).